"Aristocratic Ancestry 高贵的名门 (gāo guì dè míng mén)"
At one point of time he became the most powerful warlord in all of China, thanks to a coalition of numerous warlords in an effort to overthrow the tyrannical Dong Zhuo 董卓. He was the most powerful because he was nominated to lead the entire coalition, akin to the modern day Secretary-General of the United Nations, thanks to his noble ancestry. His great-grandfather was an interior minister that served directly under the Emperor. However Yuan Shao's power was short-lived, as he very quickly lost the respect of the other warlords in the coalition. He became known as an incompetent leader that made poor use of his resources and was too indecisive to be effective. The coalition fell apart and Yuan Shao turned back to being warlord of the northern territories. He did not last very long as Cao Cao 曹操 sought to eliminate him and bring the entire northern China under his rule. 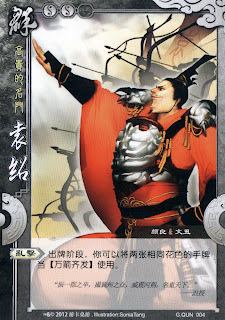 Character ability: "Barrage 乱击 (luàn jī)"
During your action phase, you can use two on-hand cards with the same suit as RAINING ARROWS 万箭齐发. The Ruler Ability is removed. Other than that, he is identical to SGS. Yuan Shao's use of arrows is already mentioned in my post on RAINING ARROWS 万箭齐发.